Aries, according to the horoscope, you can reach the top shape in January. If you like ice-skating, you may enchant your counterpart with a double Lutz or a double Axel figure. If you like warm weather, high peaks and the view from above, you can climb to the pinnacle of Kilimanjaro and get the best "selfie" of your life. Such adventure will give you confidence. Either way, January 2018 will be the month that will charge Aries people with energy they desperately need. January will be uplifting for Taurus. People born in this zodiac sign will appreciate carefree mind. Instead of a heavy Beethoven symphony, you'd prefer to listen to your favourite pop album or a nice radio that picks the right music for you. Instead of the demanding book of War and Peace from Tolstoy, you'd rather read a relaxing novel with an unusual plot. Likewise, in January 2018 Taurus will favour TV series or soap operas to demanding movies (directors such as Bergman, Tarkovsky or Kubrick). January horoscope promises a rather sleepy month to Gemini. It is more than likely that you will resemble an old can of beans. But do not be fooled! If you ever wanted to create the perfect hit and get into the world of the show business, then you have the best opportunity right now. Similarly, in the field of love, January 2018 is the ideal time when your feelings can flourish like genuine roses. Cancer, do you perceive love, money, or your job as problematic? It seems there is an issue, but January 2018 is the right time when you can overcome all troubles. However, it is necessary to act honestly, as the genuine role model (even Superman must envy you). The horoscope underlines your ability to target well and hit to black. For example, Cancer woman will not only say to a naughty husband that "this is no longer possible", but such Cancer woman will also describe all exact steps he has to do to solve the situation. Cancer will also be able to name problems at work or in home budget and find the ideal solution as well. Leo, the new year has just begun, but you'd rather bite and kill somebody. Apparently, you're facing property problems. People think that Leo is strong but generous, so he or she may bear almost everything. But that is wrong. The horoscope clearly shows that in January 2018, Leos will be slower than usual, but more careful and prudent than ever. If you will reveal a dishonest deal, or someone trying to outwit you, you will swing with a powerful paw and show who the real Leo is! Virgo, you may expect a lot of publicity – maybe you will become the star on Facebook, maybe there will be an article about you published in the local newspaper. Your popularity, whether you like it or not, will be the result of what you did last year. According to the horoscope, on January 2018 there comes a time when Virgo will make good use of the activity on the social networks, the interest in fashion and trends, as well as the political debates with friends. Last but not least, nutrition has long been influencing your judgment, whether for better or worse. Virgo, remember: "What goes around comes around". In January safety will be the most important issue for Libra. If you like going to a bar or to a disco, and you usually return late at night, you'll start thinking more about what's really going on in such an adventure. In love and partnership it will be essential how much your beloved one is able to take care of you and protect you in case of emergency. The January horoscope tells that finance and health will become areas where Libra will explore questions of freedom and security as well. Libra people don't want to be exposed to unnecessary risks of money loss. 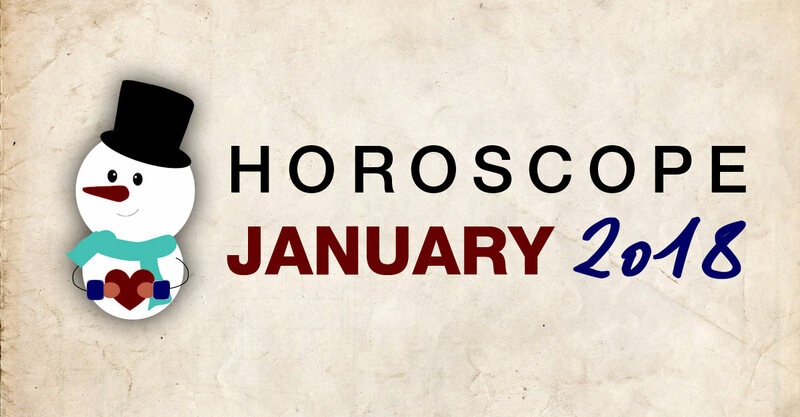 The horoscope for January 2018 unveils a special tendency accompanying people born under Scorpio. Scorpio people are usually fond of colourfulness and their fantasy resembles a New Year's Eve fireworks. But in January Scorpio will appreciate mainly simplicity and straightforwardness. This is true both in thoughts and in clothing. Men and women who would prefer bungee jumping or parachute jump last year, those may describe such ideas as unnecessary or completely crazy in January. Whoever wants may hurry towards death, but Scorpio is likely to be subjected to a thorough audit, a medical check up, or just enjoy real fun (but without much risk). Sagittarius can target all the world sides. This time, however, he or she will head north. This part of the globe will become their great inspiration. Sagittarius, you may choose something new in the IKEA store. Perhaps, you'll be fascinated by Volvo as a symbol of quality, strength and safety on the road. Perhaps you'll meet or fall in love with someone who comes from (or lives in) a city north of you. You must find the answer to this riddle yourself during January. January 2018 will resemble one big whip crack. As the horoscope tells, Capricorn will be very strict to him(her)self, but to others as well. Probably a big part of this will be caused by the New Year's resolution. You may have promised to brush your teeth after every meal. Perhaps you have also promised that you will limit the sweets and that your fridge will be full of fruit and vegetables. Maybe Capricorn also promised that he or she will no longer be tempted by new love (ending always sadly). Capricorn, count with the fact that the journey will certainly be long, but this time there is a great chance it will lead to genuine success. Two things will be important in January 2018 for Aquarius. First, justice. Secondly, transport working well. Fair pay is the key to satisfaction. Perhaps you will ask for an increase in salary during January. Aquarius people with children will also focus on whether they behave well – if they do not cheat or lie, and if they do not ask for inappropriately large pocket money. According to the horoscope, Aquarius people will also appreciate speed and quality of relocation from point A to point B. Especially because you would like to touch your beloved counterpart and do not be connected only by a mobile phone. Besides, tailbacks are also something what Aquarius sincerely hates. January will be a month of pleasure and forgiveness for all Pisces. First of all, you should forgive others what they did to you last year. Past can't be changed, but it is possible to reconcile with it. The horoscope proposes to start from the very beginning (an inner "reset" or restart). Don't worry about all the things that can't be simply fixed. Forgive also to yourself if you have not acted honestly or if you failed to overcome your weaknesses and addictions. Pisces, you will find that you feel a lot better when you accept your own mistakes and imperfections.